Windy Hill South Carolina is our specialty. Our team is committed to making the buying and selling of condos in Windy Hill, SC a pleasurable and rewarding experience. Our website allows you to search all active Windy Hill condominiums for sale. It is easy to use and navigate through condo searches. You can also save searches and get daily email alerts of new listings as they become available. 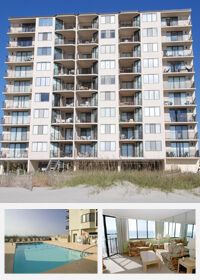 Located along some of the world's best beaches, Windy Hill Beach condos for sale offer some of the very best vacation accommodations to be found In North Myrtle Beach or anywhere else along the Grand Strand. 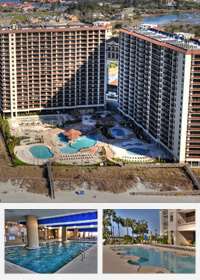 Away from the crowded beaches and commercialism of Myrtle Beach and in one of the quieter and more private areas of North Myrtle Beach, buying a condo at Windy Hill Beach still puts owners and their guests close to all the world-famous attractions for which the Grand Strand is known as well as the many great attractions of North Myrtle Beach and the northern Grand Strand. With both older low-rise and mid-rise condominiums as well as high-rise condo resorts, Windy Hill Dunes offer guests an inviting variety of luxury features and amenities which make it a top choice for returning vacationers and the wise investor as well. 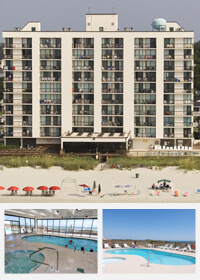 With comfortable 2 and 3-bedroom condos in North Myrtle Beach’s Windy Hill Beach section, amenities and features of the Spinnaker Resort include oceanfront pool, Wi-Fi, full kitchens, Jacuzzis in the master baths and much more, including spectacular ocean views from private balconies. In a prime North Myrtle Beach location, these 3 & 4 bedroom units feature oceanfront balcony, oceanfront pool along with a kiddie pool, Lazy River, Jacuzzi, fitness room, Wi-Fi, and grill and picnic area. Units feature spacious floorplans, and full kitchens. 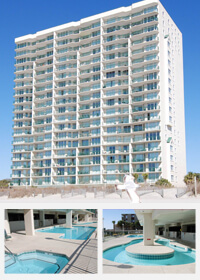 With a prime North Myrtle Beach location, the Water Point’s 3-bedroom 2-bath units feature a great oceanfront pool, indoor pool, kiddie pool, Jacuzzis and more. Rooms feature washer/dryer, fully equipped kitchen, oceanfront balcony, and a Jacuzzi tub in the master bathroom. North Beach Plantation Towers feature 1, 2, 3, 4 and 5-bedroom condominiums with a number of upscale upgrades like gourmet kitchens with top quality appliances, granite countertops, crown molding, floor to ceiling glass, large oceanfront balconies, and more. At the heart of the resort's amenities is a 2 ½ acre waterpark with six outdoor pools, including an infinity pool, lazy river, multiple outdoor hot tubs, swim-up bar and water lounge. Local attractions include the Barefoot Landing dining, shopping and entertainment complex with its House of Blues, Alabama Theater, Preservation Station, Alligator Adventure and other great attractions. Great golf, Tanger Outlet Mall and the famed Restaurant Row are just a few of the many other great nearby attractions as well.